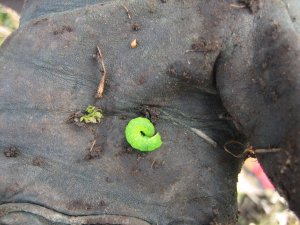 2 of these caterpillars were found while planting trees. The 1st, smaller and curled up. The 2nd, larger, curled up, but became active when placed on a warm bare hand - walked around a lot! Both green, with white stripes along sides and on back. Had 5-7 segments to the body I think? I'm going to say 6. Found on some kind of low growing nettle.